The paper describes an auditory processing-based feature extraction strategy for robust speech recognition in environments, where conventional automatic speech recognition (ASR) approaches are not successful. It incorporates a combination of gammatone filtering, modulation spectrum and non-linearity for feature extraction in the recognition chain to improve robustness, more specifically the ASR in adverse acoustic conditions. The experimental results with standard Aurora-4 large vocabulary evaluation task revealed that the proposed features provide reliable and considerable improvement in terms of robustness in different noise conditions and are comparable to those of standard feature extraction techniques. Present technological advances in speech processing systems aim at providing robust and reliable interfaces for practical deployment. Achieving robust performance of these systems in adverse and noisy environments is one of the major challenges in applications such as dictation, voice-controlled devices, human-computer dialog systems and navigation systems. Speech acquisition, processing and recognition in non-ideal acoustic environments are complex tasks due to presence of unknown additive noise and reverberation. Additive noise from interfering noise sources and convolutive noise arising from acoustic environment and transmission channel characteristics mostly contribute to the degradation of speech intelligibility as well as the performance of speech recognition systems. This article addresses the problem of achieving robustness in large vocabulary automatic speech recognition (ASR) systems by incorporating principles inspired by cochlea processing in the human auditory system. The human auditory processing system is a robust front-end for speech recognition in adverse conditions. In the recently conducted PASCAL CHiME challenge, which aimed at source separation and robust speech recognition in noisy conditions similar to that of daily life, the performance of a human was much better than that of the ASR standard baseline for different signal-to-noise ratios (SNRs). As seen from Figure1, the performance of a human is more robust and consistent than the ASR baseline. Further, the performance of both ASR baseline and human improved in line with the increase in SNR. This plot shows how susceptible the present systems are compared with a human listener with latest noise experimental setup. 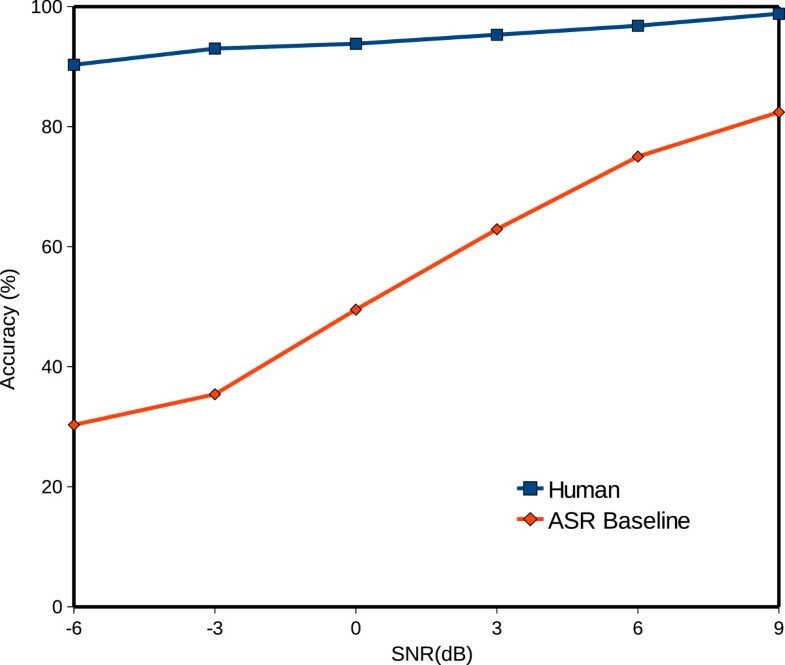 Comparison of performance accuracy for human and ASR baseline for different SNRs. The degradation of recognition accuracy for ASR systems in noisy environments is mostly due to the discrepancy between training and testing conditions. The training data are recorded in clean conditions, and the accuracy gets degraded when it is tested against data acquired in noisy conditions. Various speech signal enhancement, feature normalization and model parameterization techniques are applied at various phases of processing to reduce the mismatch between training and testing conditions[2, 3]. Spectral subtraction-, Wiener filtering-, statistical model- and subspace-based speech enhancement techniques aim at improving the quality of speech signal captured through a single microphone or microphone array[4, 5]. Feature normalization attempts to represent parameters that are less sensitive to noise by modifying the extracted features. Common techniques include cepstral mean normalization (CMN) which forces the mean of each element of the cepstral feature vector to be zero for all utterances. Other variants include mean-variance normalization (MVN), cepstral mean subtraction and variance normalization (CMSVN) and relative spectral (RASTA) filtering[2, 6]. Model adaptation approaches modify the acoustic model parameters’ match with the observed speech features[4, 7]. The auditory system-based techniques have been used in speech recognition to improve the robustness[8–15]. Examples of non-uniform frequency resolution in popular speech analysis techniques include Mel frequency-based features and perceptual linear prediction which attempt to emulate human auditory perception. The gammatone filter bank with non-uniform bandwidths and non-uniform spacing of center frequencies provided better robustness in adverse noise conditions for speech recognition tasks[12–15]. Another important characteristic, the modulation spectrum of speech, represents low temporal modulation components and is important for speech intelligibility[16, 17]. Similar to the perceptual ability of human auditory system, the relative prominence of slow temporal modulations is different at various frequencies. The gammatone filter bank-derived modulation spectral features have shown to improve the robustness for far-field speaker identification. Our previously described auditory-based modulation spectral feature is a combination of gammatone filtering and modulation spectral features for robust speech recognition. The present paper describes an alternate approach, in which the gammatone filtering, non-linearity and modulation spectrum for feature extraction are combined. The enhanced speech signal improved the accuracy of the system by reducing the sensitivity. The features derived from the combination are used to provide robustness, particularly in the context of mismatch between training and testing in noisy environments. The studied features are shown to be reliable and robust to various noises for a large vocabulary task. For comparison purposes, the recognition results obtained by using conventional features are tested, and the usage of the proposed features is proved to be efficient. The paper is organized as follows: Section Related work gives an overview of the auditory-inspired features including gammatone filter bank processing, modulation spectrum and non-linearity processing. Section Auditory processing-based features describes the methodology for feature extraction. Section Database description and experiments presents database description and experiments. Section Recognition results discusses the results, and finally, Section Conclusions concludes the paper. Most state-of-the-art ASR systems perform far below the human auditory system in the presence of noise. Auditory modeling, which simulates some properties of the human auditory system, has been applied to speech recognition systems to enhance robustness. The information coded in auditory spike trains and the information transfer processing principles found in the auditory pathway are used in. The neural synchrony is used for creating noise-robust representations of speech. The model parameters are fine-tuned to conform to the population discharge patterns in the auditory nerve which are then used to derive estimates of the spectrum on a frame-by-frame basis. This was extremely effective in noise and improved performance of the ASR dramatically. Various auditory processing-based approaches were proposed to improve robustness, and in particular, the works described in[13, 20] were focused to address the additive noise problem. Further, in, a model of auditory perception (PEMO) developed by Dau et al. is used as a front end for ASR, which performed better than the standard Mel-frequency cepstral coefficient (MFCC) for an isolated word recognition task. The auditory processing-related principles attempted to model human hearing to some extent have been applied for speech recognition[6, 17]. The modulation spectrum is an important psychoacoustic property which represents a slow temporal modulation which is significant for determining speech intelligibility. For improving robustness, the normalized modulation spectra have been proposed in. Similar work in the context of large vocabulary speech recognition such as noisy Wall Street Journal (New York, NY, USA) and GALE task as reported in[24, 25]. Feature extraction at different stages of the auditory model output to determine which component has the highest impact on the accuracy of recognition has been studied. The study also evaluated the contribution of each stage in auditory processing for improving robustness on the resource management database by using SPHINX-III speech recognition system (Carnegie Mellon University, Pittsburgh, PA, USA). Particularly, the effects of rectification, non-linearities, short-term adaptation and low-pass filtering were shown to contribute the most to robustness at low SNRs. In another study, the techniques motivated by human auditory processing are shown to improve the accuracy of automatic speech recognition systems. It was shown that non-linearities in the representation, especially non-linear threshold effect, played important role in improving robustness. Other important aspect was the impact of time-frequency resolution based on the observations that the best estimates of attributes of noise are obtained by using relatively long observation windows and frequency smoothing provides significant improvements to robust recognition. In the context of speaker identification, auditory-based features have been extensively studied. The contrasts of MFCC and gammatone frequency cepstral coefficients (GFCC) have been compared, and the noise robust improvements by GFCC has been explained in. In our earlier studies, several auditory processing-motivated features have shown considerably improved robustness for both additive noise and reverberation. However, all these above studies are confined to small and medium vocabulary tasks. In that direction, it is an attempt to apply these techniques for large and complex vocabulary task, namely Aurora-4, which is based on Wall Street Journal database. 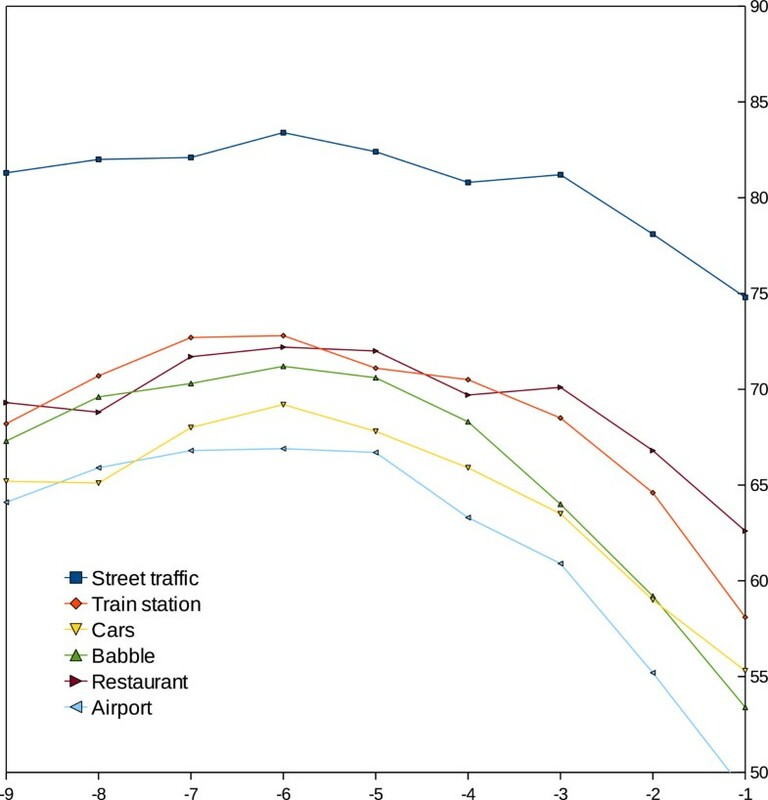 Artificially added noises ranged from SNRs of 5 to 15 dB with a variety of noises which include babble, car, street and restaurant. The effects at different stages of processing are analyzed to study the contribution of each stage for improving robustness. A preliminary version of our work was presented earlier. In this section, a general overview of gammatone filter bank-, non-linearity- and modulation spectrum-based auditory features is presented. where n is the order of the filter, b is the bandwidth of the filter, a is the amplitude, fc is the filter center frequency, and ϕ is the phase. where h m (k) is the impulse response of the filter. The frequency response of the 32-channel gammatone filter bank is as shown in Figure2. 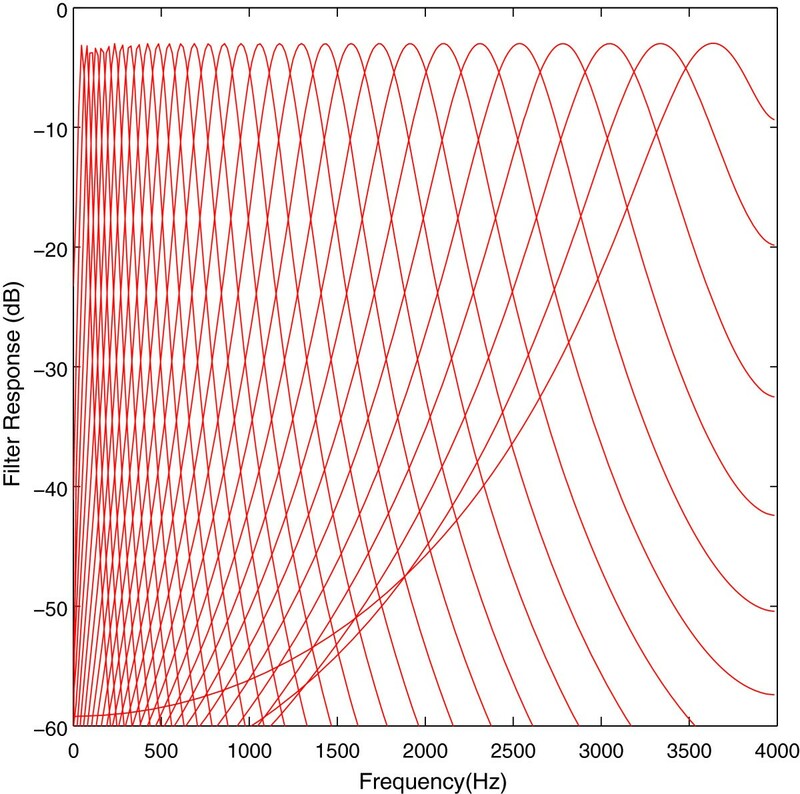 Frequency response for the 32-channel gammatone filter bank. where x i [t] is the i th channel log gamma spectral value, and y i [t] is the corresponding sigmoid compressed value. The optimal parameters are derived from evaluation of resource management development set in additive noise at 10 dB. where T is the total number of frames, and g is the modulation frequency. The relative prominence of slow temporal modulations is different at various frequencies, similar to perceptual ability of human auditory system. Most of the useful linguistic information is in the modulation frequency components from the range between 2 and 16 Hz, with dominant component at around 4 Hz[16, 17]. In, it has been shown that for noisy environments, the components of the modulation spectrum below 2 Hz and above 10 Hz are less important for speech intelligibility, particularly the band below 1 Hz which contains mostly information about the environment. Therefore, the recognition performance can be improved by suppressing this band in the feature extraction. Figures3 and4 show the spectrogram, gammatonegram and gammatonegram with non-linearity plots for two types of noise-corrupted utterance. 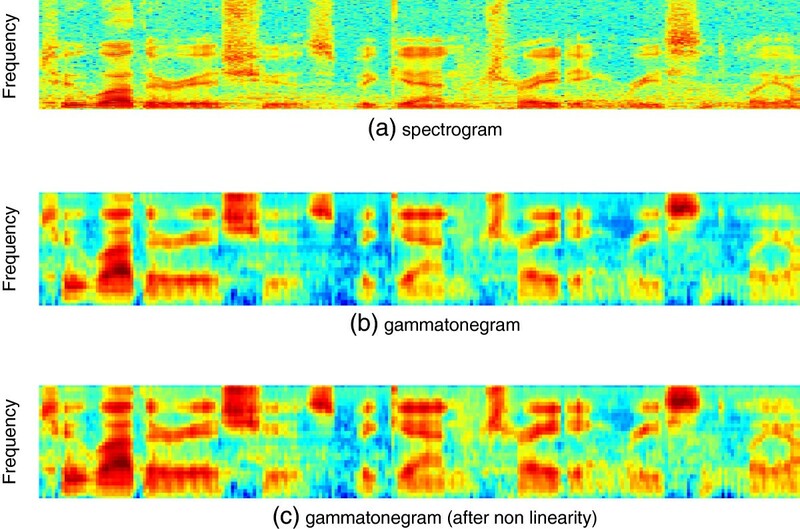 It can be observed that the gammatonegram with non-linearity plots for babble and restaurant noises provide cleaner spectral information which is important for speech recognition. 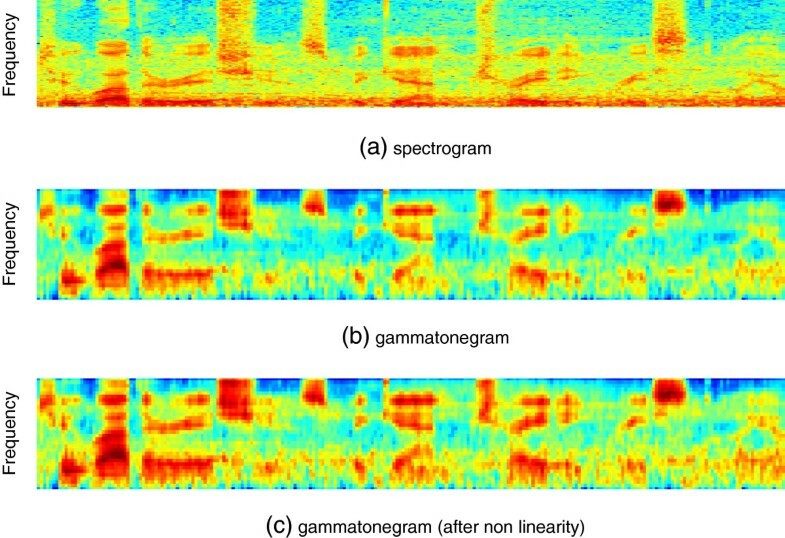 Spectrogram (a), gammatonegram (b) and gammatonegram with non-linearity (c) plots for babble noise-corrupted utterance. Spectrogram (a), gammatonegram (b) and gammatonegram with non-linearity (c) plots for restaurant noise-corrupted utterance. The Aurora 4 evaluation task provides a standard database for comparing the effectiveness of robust techniques in LVCSR tasks in the presence of mis-matched channels and additive noises. It is a part of the ETSI standardization process and derived from the standard 5k WSJ0 Wall Street Journal database. It has 7,180 training utterances of approximately 15 h and 330 test utterances with an average duration of 7 s.
The acoustic data (both training and test) are also available in two different sampling frequencies (8 and 16 kHz), compressed or uncompressed. Two different training conditions were specified. Under clean training (clean train), the training set is the full SI-84 WSJ train set processed with no noise added. Under multicondition training (multi-train), about half of the training data were recorded using one microphone; the other half were recorded under a different channel (also used in some of the test sets) with different types of noise and different SNRs added. The noise types are similar to the noisy conditions in test. The Aurora 4 test data include 14 test sets from two different channel conditions and six different added noises (in addition to the clean environment). The SNR was randomly selected between 0 and 15 dB on an utterance-by-utterance basis. Six noisy environments and one clean environment no noise (set01), car (set02), babble (set03), restaurant (set04), street (set05), airport (set06) and train (set07) are considered in the evaluation set which comprises 5,000 words under two different channel conditions. The original audio data for test conditions 1 to 7 was recorded with a Sennheiser microphone (Lower Saxony, Germany), while test conditions 8 to 14 were recorded using a second microphone that was randomly selected from a set of 18 different microphones. These included such common types as a Crown PCC-160 (Elkhart, IN, USA), Sony ECM-50PS (New York, NY, USA) and a Nakamichi CM100 (Tokyo, Japan). Noise was digitally added to this audio data to simulate operational environments. The block schematic for the feature extraction technique is shown in Figure5. The speech signal first undergoes pre-emphasis (with a coefficient of 0.97), which flattens the frequency characteristics of the speech signal. The signal is then processed by a gammatone filter bank which uses 32 frequency channels equally spaced on the equivalent ERB scale as shown in Figure2. The computationally efficient gammatone filter bank implementation as described in is used. The gammatone filter bank transform is computed over L ms, and the segment is shifted by n ms. The log magnitude resulting coefficients are then decorrelated by applying a discrete cosine transform (DCT). The computations are made over all the incoming signal, resulting in a sequence of energy magnitudes for each band sampled at 1/n Hz. Then, frame-by-frame analysis is performed, and a N-dimensional parameter is obtained for each frame. The modulation energy of each coefficient, which is defined as the Fourier transform of its temporal evolution, is computed. In each band, the modulations of the signal are analyzed by computing FFT over the P ms Hamming window, and the segment is shifted by p ms. The energies for the frequencies between the 2 and 16 Hz, which represent the important components for the speech signal are computed. For the experiments and gammatonegrams shown in Figures3 and4, the values of L, n and N are 25 ms, 10 ms and 32, respectively, and modulation parameters of P and p with 160 and 10ms, respectively, are used. Processing stages of the non-linear spectro-temporal feature extraction. The HTK setup followed is three-state cross-word triphone models tied to approximately 3,000 tied states, each represented by four-component Gaussian mixtures with diagonal covariance, together with the 5,000 closed vocabulary bigram language model (LM). Triphone states were tied using the linguistic-driven top-down decision-tree clustering technique, resulting in a total of 3,135 tied states in clean train and 3,068 tied states in multi-train. The CMU dictionary was used to map lexical items into phoneme strings, and the 5,000-word closed vocabulary bigram LM was used. The LM weights, pruning thresholds and insertion penalties were based on. In order to analyze the effect of the non-linearity (Equation 4) on phone recognition rate, small subsets with a random number of utterances from AURORA-4 multi-condition training data are used. Experiments with training on clean condition are considered, because the purpose is precisely to test robustness in the presence of noise while retaining similar performance in clean conditions. All experiments have been performed with 16-kHz data of the Aurora-4 database. Table1 shows the results in percent accuracy for the different features. The average performance for all the noise conditions for the different features is shown at the last row of the table. MFCC, perceptual linear prediction (PLP) and GFCC are the standard 39-dimensional Mel-frequency, perceptual linear prediction and gammafrequency cepstral coefficient features along with their delta and acceleration derivatives. From Table1, it is clear that the traditional MFCC features have the lowest accuracy indicating inefficiency of these features for noisy environments. Also, it can be seen that GFCC has the best performance compared to PLP which, in turn, was better when compared to MFCC which is consistent with earlier studies[13, 14]. Table2 shows the results for gammafrequency with modulation spectrum (GFCC-MS), gammafrequency with modulation spectrum and non-linearity (GFCC-MS-NL) and gammafrequency with non-linearity (GFCC-NL) feature extraction techniques. For this task, we can see that the GFCC-MS do not provide any improvement which is contrary to our earlier study. In our earlier study, the combination of GFCC and modulation spectrum was better than GFCC alone for isolated word recognition in reverberant environment of around 0.3 to 0.5 s.
We hypothesize that we do not observe the similar effect in this case due to different task (large vocabulary with triphones) and different environment (only additive). However, from the table, we can see that the optimized non-linearity improved the performance of GFCC and GFCC-MS considerably. Further, we can also be observe that the contribution towards improved performance from the non-linearity is consistent for all types of noises. This clearly demonstrates that including a non-linearity is significantly beneficial for improving robustness in noisy environment. The features are computed with w2 = 1.0 and various w0 and w1 combinations. As seen from Figure6, the selection of the weights is crucial for improving the recognition performance. It can also be observed that for w1 ranging from -0.7 to -1.8, the performance is better than those of GFCC-MS and GFCC. The best performance for this task is obtained with w0 = 1 and w1 = -0.9 which are used for the experiments reported in Table2. Comparison of word accuracies (%) for various w 1 values of different noises. The features proposed in the present study are derived from auditory characteristics, which include gammatone filtering, non-linear processing and modulation spectral processing, emulating the cochlear and the middle ear to improve robustness. In earlier studies, several auditory processing-motivated features have improved robustness for small and medium vocabulary tasks. The paper has studied the application of these techniques to large and complex vocabulary task, namely, the Aurora-4 database. The results have shown that the proposed features considerably improved the robustness in all types of noise conditions. However, the present study is essentially confined to handle noise effects on speech and has not considered reverberant conditions. The selected weights for the non-linearity were heuristic, and automatic selection of optimal weights from the evaluation data is desirable. For the future, we would like to investigate these issues and evaluate the performance of the proposed features for reverberant environments and large vocabulary tasks.